Executive Summary: California is at a tipping point; both the government and private market are failing to meet the needs of a vast majority of the state’s 17.5 million renters. Skyrocketing rents, intensifying threats of eviction, and ongoing displacement are all part of a broader crisis of widening inequality and structural exclusion that is testing our values and identity as a state. The consequences are far-reaching: people are being pushed out of their communities, into homelessness, and away from jobs and opportunity. As a state, we face health, environmental, economic, and societal costs that can last generations. The extent of these long-term harms will be determined in large part by how we respond today. This moment requires that local governments have the ability to enact immediate solutions to protect tenants from unfair rent increases as well as wholesale evictions. Watch a recording of a presentation by the report's co-authors Nicole Montojo and Stephen Barton above, and visit this page for a transcript. California has reached a tipping point where policies and the private market are failing to meet the needs of the majority of renters. There are over 9.5 million Californians living in rent-burdened households and there has been a startling increase of approximately 3.7 million rent-burdened tenants since the year 2000. The housing crisis also harms Californians’ physical and mental health. Exposure to hazardous conditions in the home, social isolation, severe stress, and other health problems are being exacerbated. Rising rents have pushed many residents into homelessness. California now has the largest number of people experiencing homelessness among all 50 states, and research shows a clear link between rising rents and increased homelessness. Stabilizing rents would have broader benefits to the state’s economy, environment, and public services—from improved traffic conditions and reduced traffic-related greenhouse gas emissions, to increased spending by tenants in their local economy. Seniors, Latinos, African Americans, low-wage workers, and families with children face the most severe burdens from the housing crisis. Rapidly increasing rents are displacing residents to areas with fewer quality jobs, well-performing schools, and other resources—reproducing racial segregation, particularly in suburban areas far from urban jobs centers. The numerous, far-reaching impacts of the housing affordability crisis, and the inability of the current market and government policies to resolve them, point to a pressing need for policy change. 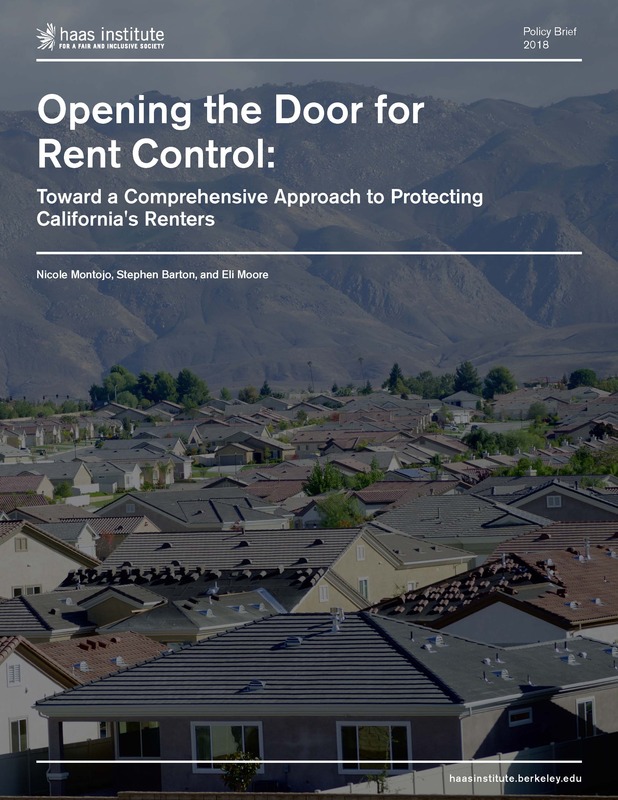 Part II of this research brief focuses on the rationale for rent control policy and the importance of allowing government to fulfill its responsibility to rebalance the broken housing market and advance public well-being. We discuss the specific function of rent control policies, situating them within a broader set of strategies to address the housing affordability crisis in both the near and long term. This brief is not intended to provide a detailed policy agenda or propose specific policy designs, as we know that this must come from further conversations that involve a full range of stakeholders. Instead, we focus on where we believe the conversations must start—with opening the door for local governments and the state to design and enact rent control policies that can truly address the immediate needs of California’s renters. While it will not solve the housing affordability crisis on its own, rent control is part of a needed adjustment to the rules of the market to ensure Californians’ access to housing. Rent control has several unique, essential benefits related to current housing challenges facing California. The policy can stabilize rents for existing tenants, improve affordability for tenants in the future, and preserve the existing affordability of housing that may otherwise become unaffordable. Rent control is a cost effective policy with immediate effects: Where most other programs require tremendous financial resources and take a great deal of time, renter protections can be established as a matter of law and the administration of rent control is typically paid for through modest per-unit fees. The disadvantages of rent control policies do not outweigh its benefits. Claims that rent control has negative effects on development of new housing are generally not supported by research, but if there are some modest effects in that direction, they should be mitigated by other policy and investment mechanisms. The urgent need for stabilizing rents for tenants in the state makes this a policy priority. Housing production is needed, but only rent control will provide a near-term solution for renters. The magnitude of California’s housing shortage indicates just how long-term any effort to resolve the crisis must be. The state currently has an affordable housing gap of 1.5 million homes for extremely low- and very low-income households, and overall, it needs to build 3.5 million new homes by 2025 to accommodate current demand, pent-up or latent demand, and projected population growth. Thus, rent control can provide a timely solution that the market will not. While millions are struggling with housing instability and the threat of displacement due to extreme rent increases, our policy debates over solutions are too narrow when it comes to the needs of renters. Laws like Costa Hawkins have placed restrictions that limit communities’ ability to meet the needs of those who are hardest hit by the crisis—and furthermore, establish a path toward a better quality of life for all Californians. How do we protect over-burdened renters from displacement and increase the supply of housing to meet the needs of people at all income levels? We assert that California can and must do both—protect cost-burdened renters from exorbitant rent increases and forced moves while also producing new housing, provided that we take a comprehensive approach that includes rent control among multiple policy mechanisms and investments. This brief seeks to provide a framework to inform further statewide conversations on how government must answer the key policy question we put forward. By responding to the urgent needs of residents facing displacement, rent control gives us a chance to continue working on a long-term strategy that integrates renter protections with housing production. The key concern is timing. While rent control alone will not solve the housing crisis, it is arguably the only viable policy that can act at the speed and scale needed. Tenants need immediate relief from extreme hardships they face, and we cannot afford to wait. What if all Californians had the stability and access to opportunity needed to fully participate in our democracy, contribute to their communities, and take part in the collective effort to advance the public well-being? For California to even be able to consider this question, we must first and foremost protect and prioritize existing residents’ stability. Rent control can preserve people’s access to emerging opportunities in their current neighborhoods and help open up new housing choices that come with increased financial stability. It allows residents to remain a part of the communities that they have invested in and built, access well-paying jobs, and build savings that facilitate upward mobility. It provides families with the ability to have peace of mind, to plan for a future, and to belong to a community. We assert that these benefits, as well as the broader societal benefits that they contribute to, are invaluable. California must strive toward achieving them by upholding housing stability for renters as a key public policy goal. To do this, cities need to be able to have these conversations about policy design and consider all options that may be necessary to ensuring the broadest range of benefits to their citizens. Editor's note: This report was updated on Oct. 12, 2018 to correct comparability issues with US Census Bureau data from the 2000 Decennial Census and American Community Survey, as well as an error in the data on renter cost burden by race and ethnicity shown in Figure 5.